Here's the key point in the minutes of the Fed's policy-setting Federal Open Market Committee meeting on Nov. 2-3: The central bank now expects a weaker recovery, with as many as six years needed to return the unemployment rate to normal levels of 5% to 6%. The Fed also held a special, undisclosed meeting on Oct. 15 "to discuss issues associated with its monetary policy framework including alternative ways to express and communicate the Committee's objectives." 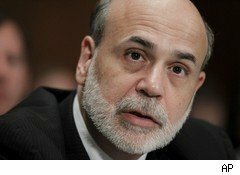 Among those issues was whether Federal Reserve Chairman Ben Bernanke should hold occasional press conferences. First, the data forecast. The Fed lowered its 2010 GDP growth estimate to a range of 2.4% to 2.5% from June's 3% to 3.5% projection. It also lowered its 2011 GDP forecast to 3% to 3.6% from June's 3.5% to 4.2%. On unemployment, the Fed now expects a 2010 jobless rate of 9.5% to 9.7%, up slightly from the 9.2% to 9.5% June forecast, and a 2011 jobless rate of 8.9% to 9.1%, up from the 8.3% to 8.7% June forecast. On inflation, the central bank now sees 2010 core-PCE inflation of 0.8% to 1%, up from June's 1% to 1.1% forecast, and 2011 Core-PCE inflation of 0.9% to 1.6%, slightly wider than June's 0.9% to 1.3%. Most Fed board members expected the second phase of the Fed's quantitative easing policy, the so-called QE2, "to help promote a somewhat stronger recovery in output and employment while also helping return inflation, over time, to levels consistent with" the Fed's legislative mandate, the minutes said. The dissenting voices were also noted: "Some participants noted concerns that additional expansion of the Federal Reserve's balance sheet could put unwanted downward pressure on the dollar's value in foreign exchange markets." The Fed said it chose the small asset purchase approach, rather than larger purchases, due to the economy's recovery track. "Participants generally agreed that large adjustments had been appropriate when economic activity was declining sharply in response to the financial crisis. In current circumstances, however, most saw advantages to a more incremental approach that would involve smaller changes in the Committee's holdings of securities calibrated to incoming data," the minutes said. At the Oct. 15 special meeting, in addition to discussing whether it would be "useful" for Chairman Bernanke to "hold occasional press briefings to provide more detailed information to the public regarding the Committee's assessment of the outlook and its policy decisionmaking," Fed officials also discussed whether to adopt a numerical inflation target. However, they opted to retain the policy of issuing long-term inflation projections.